Despite confirming its participation in the BIMSTEC multilateral exercise in India, the Nepalese Army withdrew its contingent stating a ‘political’ decision. Bay of Bengal Initiative on Multi-Sectoral Technical and Economic Cooperation (BIMSTEC) is a sub-regional grouping involving seven countries in South Asia and South East Asia. The BIMSTEC states are those which are on the shore or are adjacent to the Bay of Bengal and are dependent on it. They are Thailand, Myanmar from South East Asia and Sri Lanka, Bhutan, Bangladesh, Nepal and India from South Asia. The international organization was formed on 6th of June 1997, through the Bangkok declaration and is headquartered at Dhaka in Bangladesh. Technological and economic cooperation among south Asian and south East Asian countries along the coast of the Bay of Bengal. BIMSTEC is a sector driven cooperative organization and covers cooperation in sectors like communication, leather, textiles, transport, fisheries, human resource development, tourism, agriculture, investment, technology and commerce etc. Currently, there are fourteen priority sectors and each member country voluntarily leads one or more sectors. Counter terrorism & transnational crime and telecommunication & transport are dealt with by India. The grouping is a bridge between South Asia and South East Asia and constitutes a reinforcement of relations between the seven countries. It is of utmost significance to India as it is a major support in implementing its Act East Policy and the development of its ambitious ‘Sagar Mala’ project. Despite several attempts at a reset, ties between India and Nepal continue to be a cause for concern. The disconnect between the two governments was most visible at the seven-nation BIMSTEC military exercises that recently concluded. Officials in Prime Minister K.P. Oli’s office said that they were upset with Prime Minister Narendra Modi’s “unilateral” announcement of the multilateral exercises during the BIMSTEC summit on August 30-31, without having formally proposed it to the hosts. Sources say that the ruling party in Nepal, the Nepal Communist Party, is divided on the BIMSTEC military exercise, with many feeling that such a multilateral exercise will be seen as the formation of a military block. This will go against Nepal’s history of not belonging to any such block. Additionally, the contingent from Thailand also did not join the counter-terror exercises because of lack of adequate notice. Nepal’s decision to join China for a 12-day Mt Everest Friendship Exercise in Sichuan province, also focussed on anti-terrorism drills, drives the wedge in further. Despite New Delhi signalling its discomfiture with the volume of Chinese investment in hydropower and infrastructure and transport projects, Nepal went ahead recently and finalised an ambitious connectivity proposal that will eventually link Kathmandu to Shigatse by rail; this will give Nepali goods access to Chinese sea-ports at Tianjin, Shenzhen, Lianyungang and Zhanjiang, and land ports in Lanzhou, Lhasa and Shigatse. India is still blamed for the 2015 economic blockade against Nepal. It is also held responsible for attempts to destabilise Mr. Oli’s previous tenure as Prime Minister during 2015-2016. India and Nepal don’t just share an open border; they have shared the deepest military links, with both countries traditionally awarding each other’s Army chiefs the honorary rank of General. Such unique ties must not be undermined due to lack of communication. New Delhi and Kathmandu must put an end to the unseemly controversy by renewing diplomatic efforts over the issue. The larger geopolitical context of the discord over the military exercises must not be ignored. New Delhi cannot turn a blind eye to the rebuffs, and must address them. At such a time, the Army chief, General Bipin Rawat’s statement on BIMSTEC, that “geography” will ensure that countries like Bhutan and Nepal “cannot delink themselves” from India, could have been avoided; such comments unnerve India’s smaller neighbours and are misleading. Modern technology and connectivity projects could well take away geography’s role as a guarantor of good relations. The Centre proposed the unification of state-owned Bank of Baroda, Dena Bank and Vijaya Bank to create India’s third largest bank with a total business of more than ₹14.82 trillion as parts of reforms in the public sector banking segment. It will oversee proposals of amalgamation of public sector banks. After getting in-principle approval, the banks will take steps in accordance with the law and SEBI requirements. The alternative mechanism will include a panel of ministers, whose members will be decided by the Prime Minister. The merger will be based purely on commercial considerations. It had envisaged a three-tier banking structure with three large banks with international presence at the top, eight to 10 national banks at tier two, and a large number of regional and local banks at the bottom. Under the Bank Nationalisation Act 1969, there are provisions allowing such mergers. However, such decisions must be approved by Parliament. Section 44A of Banking Regulation Act 1949 lays down the norms for voluntary mergers and “forced” mergers are done under Section 45 of the Act. One of the core reasons behind the choice of these banks was perhaps the fact that all three use the same core banking system—Finacle from Infosys—making the task of merging the technology platforms and back-ends relatively easier. The government has also moved to offload its majority stake in IDBI Bank to Life Insurance Corporation of India. India aspiring to be the fastest growing economy has to be supported by stronger and globally competitive banks with increased choices to the stakeholders. 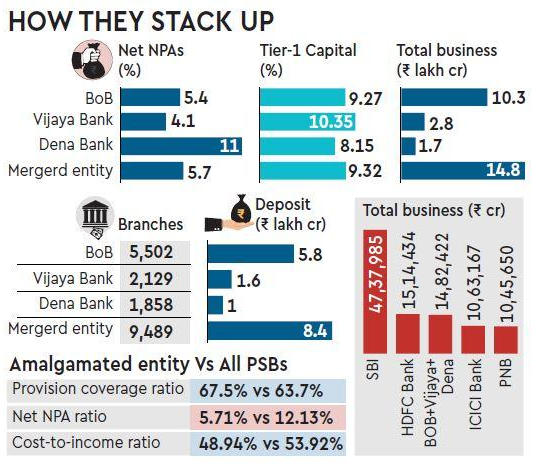 Dena Bank has been placed under the prompt corrective action framework (It is in a bad shape with higher NPAs, higher cost to income and falling profitability). So the idea is to merge the weaker bank with stronger bank (BoB and Vijaya Bank) so that it would be a strong competitive bank with economies of scale. The entity would also be positioned for substantial rise in customer base, market reach and operational efficiency. The amalgamation is aimed at catering the massive credit requirements of the growing economy, and cutting costs as well as dependence on the government for capital infusion in the longer term. What else can the Govt consider while apart from weak strong banking? Corporation Bank and Canara Bank are known for a better network in the South while Punjab National Bank is more prominent in the North. Merger of banks based on geography will result in lesser disruption in terms of rationalization of branches and people. In a new emerging banking model, there are already niche players like payment banks (retail payments), Small Finance Banks (doing micro loans ), full scale banks ( Axis or an HDFC Bank) and universal banks (ICICI Bank or a Kotak Bank). There is a space for creating certain niche entities like an SME focused bank or an MSME focused bank. This can be achieved by merging few PSBS with a new mandate to cover a particular sector. The Government had taken comparable step with the merger of the five associate banks of SBI. The merger had resulted in a sharp jump in the combined entity’s bad loans portfolio, crimping its profit. It is expected to reduce the amount of capital it needs to pump into these lenders and help clean their balance sheets. There is no evidence that merger of banks would strengthen the banks or make it more efficient. Even though they are public sector banks, each one have different culture. The approach and attitude is not to change quickly. “The Future of Jobs 2018” report by WEF predicts that the rise of robotics will result in machines performing more tasks on the job than humans by 2025. It also estimates that while that trend could displace 75 million jobs globally by 2022, it’ll create 133 million new positions. The report surveyed executives from different industries around the world, aiming to get a look at how new technologies, like artificial intelligence, will affect the global labor force. In 2018, humans performed an average of 71% of total task hours across the 12 industries spanning manufacturing, services and high tech. By 2025, that will drop to just 48%, according to the WEF. 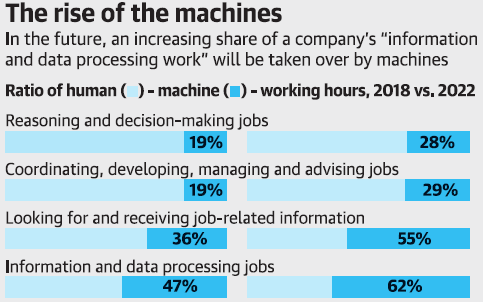 Machines will perform the remaining 52%. However, new jobs will still lead to a net gain in employment opportunities if sufficient reskilling is done. Roles that rely on human skills, like sales, marketing and scientific-based positions, will likely see an increase in demand. The report calls on businesses and government leaders around the world to create a support system for their employees and ensure a smooth transition as the workforce evolves. They expect that some routine-based human-held positions will become non-essential in the future, like data entry or payroll clerks. There could be risk of widening skill gaps, heightening inequality and raising polarisation if managed poorly. WEF says reskilling and upskilling of employees as an urgent imperative. Why this high amount of arrears id pending? Why rivers are becoming more polluted?